Welcome to Steamboat Springs! It�s hard to decide what exactly makes Steamboat Springs such an incredible place to visit and live. Is it the stunning scenery, abundant wildlife, unparalleled Olympic skiing tradition, limitless outdoor recreation opportunities, western charm and hospitality, world-class ski resort, friendly community, vibrant arts and culture, or the endless open spaces that go on as far as the eye can see? Or is it the unique combination of all of these things that makes Steamboat�.well, simply�Steamboat. As Executive Director of the Tread of Pioneers Museum, I have the privilege and honor of working to collect, preserve and share the unique history and heritage that makes Steamboat Springs a place like no other. Some of the same special qualities that drew the Ute Indians and early settlers to this beautiful area, like the abundant mineral springs and Yampa River, beckon people from around the world today. We invite you to experience all that Steamboat has to offer and discover the people and events that shaped this once wild western frontier outpost into a beloved Rocky Mountain destination resort town. Visit the Tread of Pioneers Museum on 8th and Oak Street downtown, to explore the ways of the Native Americans, early settlers, miners, ranchers, skiers, outlaws, and lawmen. While you�re here, find out why Steamboat Springs is home to more Olympic athletes than any other town in North America. Digging deeper into the history of the area is sure to grow your love of Steamboat, and show you a place you will always call home. The Museum is a 501(c)(3) and an affiliate member of the Steamboat Springs Arts Council and the Steamboat Springs Chamber Resort Assoc. 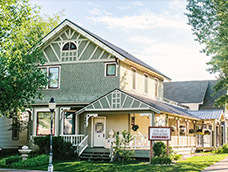 The Museum is also a member of the American Association of Museums, Mountain Plains Museum Association, Colorado and Wyoming Association of Museums, the American Association of State and Local History, and the National Trust for Historic Preservation.